I’m not gonna sugar coat it, the result of this week’s crafting effort was not aesthetically pleasing. I get them when I forget my reusable grocery bags at home. I save them and try to find ways to re-purpose them, but the pile keeps growing. I take them back to the store where they “recycle” them, but who knows what that really means. And so, with all of this in mind, it seemed like the right thing to do to use them this week to make a holiday wreath. I was inspired by the wreath above, which I saw online at CraftsnCoffee.com, and thought I would try recreating the look. My sister-in-law gave me this very old, very faded wreath because she knows about my desire to upcycle. And I thought it would be the perfect base! I went through some steps to “ready my materials,” like removing the leaves from the wreath and cutting any writing off the bags. Initially, I tried tying the bags onto the wreath like ribbons—which looked HORRIBLE! I tried to pretty it up with some old bows, which look so earnest against those wadded up plastic bags. And I think I’ll just stop here. I tried photographing the wreath with different lighting…and at different angles. But bless my heart, it is laughably ugly. 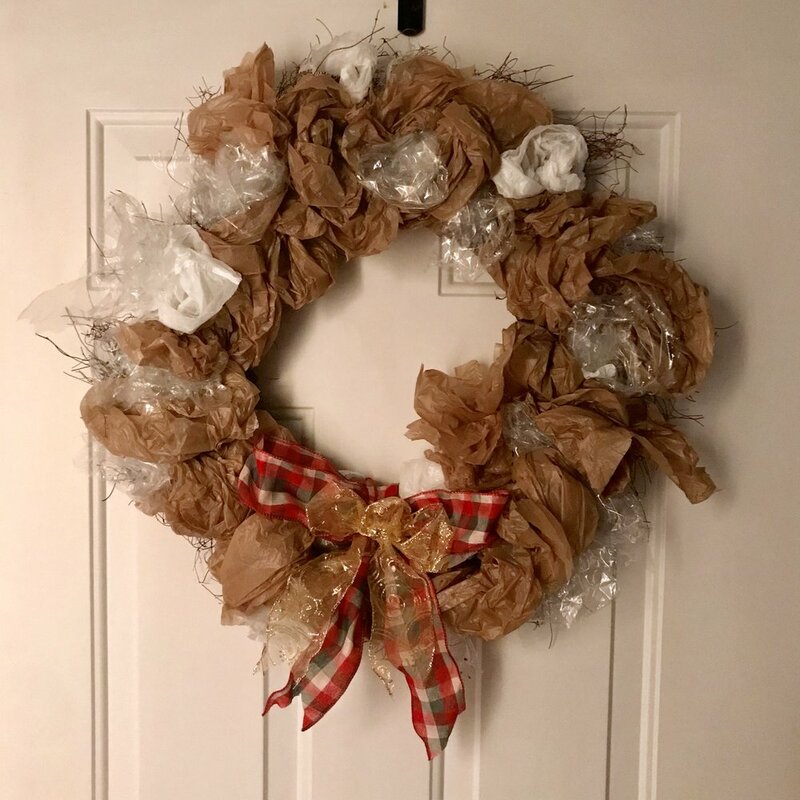 Since my failure to successfully re-purpose the plastic bags, I’ve been thinking, and I’ve come to the conclusion that I could have made the wreath look better if I’d used all white bags. But I don’t have many because my local grocery uses the “recycled” ones to make us feel better about creating gobs of garbage. I had originally thought I could paint them, but I figured the paint would never dry. After talking to my sister again, she informed me that there is spray paint for plastic, so at least we learned something. I also did a little research and found some crafty people who have ways to reuse plastic much more successfully. If you have a minute, you should watch this video about incredibly thoughtful and kind women turning plastic bags into sleeping mats for the homeless. When my crafting was all said and done, I went to the Christmas tree farm to get a tree with our family and found the wreaths above, which are made out of tree clippings. So my craft was a bust, but I found a holiday wreath made of upcycled materials AND I learned about some really great people devoting their time and talents to others in need. I’m counting this week’s challenge as a success.